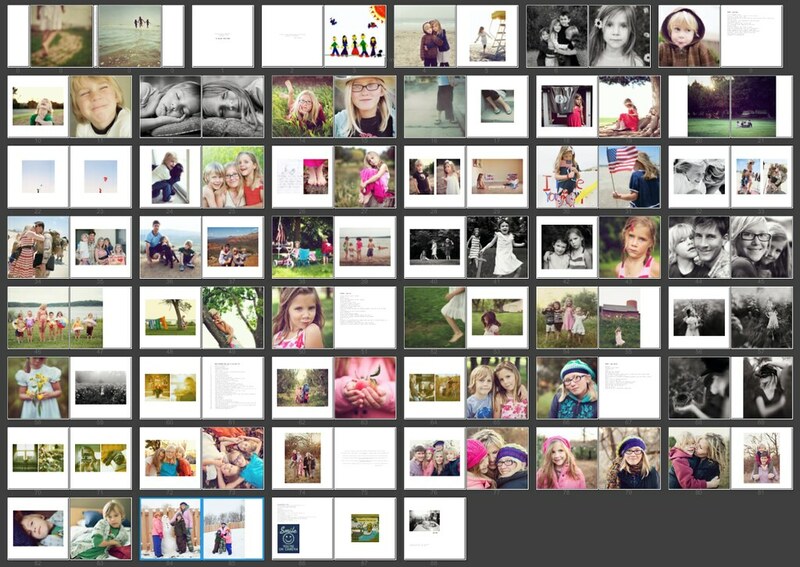 ...i've been working on my family's annual book. anyone who's read my blog over the past couple years, probably already knows how much i adore and treasure my family books. they grace our credenza right as you walk in the door and i get chills each and every time i look through one of the books. last night, i found the kids looking through them -- laughing and giggling as they turned the pages. i've been doing an annual book ever since i started photography . i always joke that if there's a fire and my family is all safe, my books are next to be saved from the flames. but i'm serious. i started working on the book a bit earlier than usual, so i'm not rushing to get it done the end of november. i give the books to grandparents for christmas every year and need to make sure i allow time for printing and shipping. this year my book is called life passes so fast, with an accompanying closing quote on the last page. sigh! a bit about my book-making process: i design the book from scratch [no template]. 11x13 landscape format. hard cover and premium matte paper. use booksmart via blurb. every year is different (e.g. here's last year's layout). include favorite photos from the year. quotes to go with some of the photos. words | thoughts about each child. every book is unique. and so very special. in closing... i beg you to get your digital files off your computer and printed. on your walls. in a book. somewhere. anywhere. i'll be sharing another project i've been working on in a few days. just a couple more things to get done first. i've briefly mentioned my family's annual book on my blog before, but wanted to share more, as it's one of my most treasured items. prints on the wall come and go. digital files usually stay wherever they stay. but my books...i love them so!! i look at my books often. and i share my books often. some pages make me laugh out loud. some pages bring tears to my eyes. as i look, read and remember. for my book, i include my most favorite photographs from throughout the year. i also always include notes about each kid. for example, this year, sky's says: loves, loves, loves to draw. gifted. great student. called "so memorable" by her teacher. witty and funny. snugly. and oh so cute! is a great friend to everyone. learned to read on her own. reading at a third grade level. doesn't mind messy. loves her animal figures and stuffed animals. and has a ton of them. strong. loves gymnastics and is doing awesome. great listener. loves to make people happy. misses her san diego friends--amaya and catie. enjoying her lansing friends--kimberly and aubrey. loves to sing. shy. learned to blow bubbles with bubble gum (and was so excited about it). became a confident bike rider. started out the year only wanting to wear dresses. ended the year only wanting to wear shirts and pants. and then the rest of the book varies from year to year--quotes, stories, drawings, etc. whatever my heart feels is needed to complete the book for that year. last year was quotes. this year was personal stories, drawings and such. we, of course, have a copy of each book, since i started in 2006. and then we give a book every year, as a christmas gift, to our parents and a couple other very special people in our lives. i order the book from blurb. it's not quite the quality of my client books; however, it's much, much cheaper. and when there's 90 pages and i'm purchasing five of the books, i need cheaper. anyone can use blurb. the interface takes a bit of getting used to, but once you get it, it's really pretty easy. so i encourage you. to make something to document your family's year. it doesn't have to be professional. it doesn't have to be digital; you could scrapbook it. just something. because they grow to fast. and while we try so hard to remember, we forget many of the stories. and whatever that something is, make it yours. i promise...it's time worth spending!! and something you will forever treasure! !